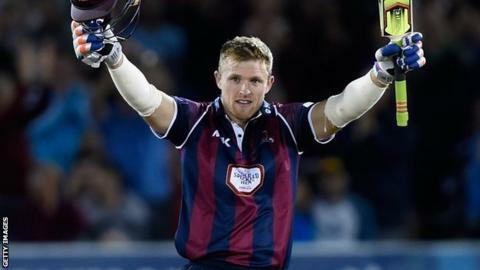 Yorkshire have signed Northants and England all-rounder David Willey on a three-year deal. The 25-year-old will join the White Rose club for the start of next season. Willey, who has played five limited-overs games for the national team, took a hat-trick to help Northants win the FLt20 trophy in 2013 and has also claimed 148 first-class wickets. "I'm looking forward to working with Jason Gillespie and the rest of the lads," he told the county website. "He will add considerable firepower to Yorkshire's ranks next season. "He recently powered Northants into the T20 Blast finals day with the fastest century in the format by an Englishman. That kind of hitting will be welcome at Headingley." Last week, Willey smashed a 40-ball century against Sussex to steer Northants through to the quarter-finals of this year's T20 Blast competition. And he admitted it would be a wrench to leave the club for whom he made his first-team debut in 2009. "This has been a tough decision to make because of my personal attachment to the County Ground. I came here many, many times as a boy and dreamed of playing for Northants," the left-arm quick bowler said. "I will always be grateful for the years of coaching and mentoring that I have received which gave me the best start to my career. "However, I feel that the time is right to move on, to experience a new approach to training and to broaden my cricket education. Yorkshire gives me the best opportunity to challenge myself working alongside some of the best players in the country." Joe Root, Gary Ballance, Adam Lyth, Adil Rashid, Jonny Bairstow, Tim Bresnan, Liam Plunkett and David Willey will have all played for their country in the last couple of seasons. Northants head coach David Ripley told BBC Radio Northampton: "He's one of our best players so obviously there's disappointment about that, but certainly no bitterness. He [Willey] has come through the system and been a great ambassador for the club. "We hoped to keep him for the last year of his contract, but we also appreciate that his desire to play Test cricket might be better suited in Division One. "It's difficult to argue with that; he's going to a good club and if he makes it to the Test match arena then good on him."